Wedding is a lifetime affair and is a paradisaical event with unmatched dreams in starry eyes. This day can be memorable like never before if you choose a perfect couture for this grand event. So steer clear all your worries with the exclusive Chhabra 555 Bridal range featuring all velvets, brocades, silks, satins with a dab of heavy embellishments. Perfectly synchronized thread work and contemporary detailing make the collection energetic and extravagant, stylish yet very comfortable to wear. Chhabra 555 has incorporated traditional motifs with a modern twist which look subtle & sublime at the same time. The collection carries dramatic volume and the exaggerated ruffles with a punch of bright hued delightful detailing. Stylized jacket-lehengas, embellished blouses with bordered sarees, heavy resham drapes & definitive embellished suits are the main highlights of the collection. Actress Bhama at ‘Kochi Fashion Week” wearing a gold color bridal saree. Gold coloured bridal saree with zari works at the border. Paired with quarter sleeves, v necked blouse. Bollywood actress in beautiful green designer bridal silk saree with magenta silk border. Gold zari work through out border,running pallu. Paired with cream designer ruffled sleeves saree blouse with round neck pattern. South Indian actress Isha Chawla looking beautiful pink designer silk bridal saree at RS Brothers Anniversary. Gold printed floral designs all over saree. Pure zari work across it orange border,running pallu. Paired with designer short sleeves silk saree blouse. 1. Model displaying beautiful magenta designer embroidery crystalized bridal saree with embroidered sequins buttes,stones all over saree and embellished with patch work border paired with designer embroidered sleeveless saree blouse. 2. Model walks in beautiful white designer embroidery crystalized bridal lehenga with embroidered sequins buttes,stones all over saree and embellished with patch work border paired with designer embroidered sleeveless saree blouse. 3. Model displaying beautiful pink designer bridal lehenga with embroidered sequins buttes,small mirror work all over saree and patch work border paired with designer embroidered sleeveless saree blouse. 4. Model walks in beautiful white designer bridal saree with embroidered sequins buttes all over saree and red border, embellished with patch,thread work on it.It is paired with designer embroidered short sleeves saree blouse. South Indian actress Sunita Rana in beautiful pink designer silk bridal saree. Gold printed leafs all over saree and pure zari work border. Paired with designer ruffled sleeves saree blouse with pattern. South Indian actress Anushka in beautiful gold designer bridal silk saree with pure gold zari work border. Green printed flowers all over saree. It has running pallu. Contrast with designer embellished short sleeves saree blouse with round neck pattern. Small patch work and sequins buttes all over. Bollywood actress Rekha in beautiful off white designer bridal silk saree with pure zari work border at 61st Idea Filmfare Awards 2014. It has running pallu, gold patch work designs all over saree. Paired with designer quarter sleeves saree blouse. Bollywood actress Rekha in beautiful gold and cream mixed silk bridal saree with pure zari work border at the star-studded screening of ‘Lekar Hum Deewana Dil’. It has running pallu. Paired with designer 3/4th sleeves quarter sleeves saree blouse for back. South Indian actress Easha in beautiful maroon and gold mixed silk bridal saree. Heavy gold embellished work all over saree and gold zari border. It has running pallu. Paired with designer short sleeves silk saree blouse. Bollywood actress Rekha in beautiful off white designer bridal silk saree with pure zari work border. It has running pallu, gold patch work designs all over saree. Paired with designer quarter sleeves saree blouse. 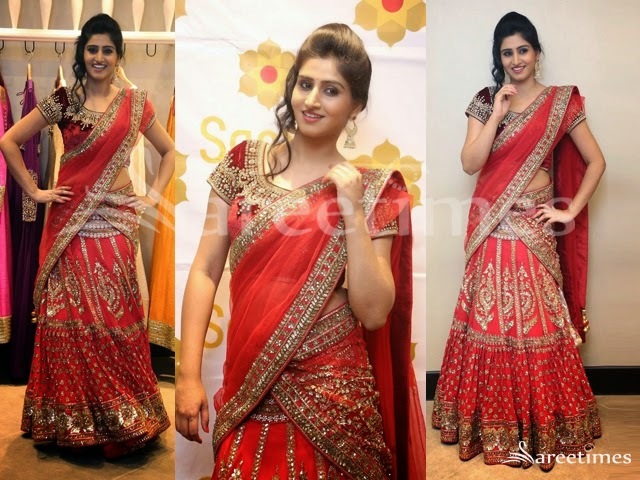 South Indian model Shamili in beautiful red designer bridal half saree. Heavy gold embellished patch and embroidered work all over lehenga and across it border. It is a red netted dupatta with patch work border. Paired with maroon designer embroidered velvet short sleeves saree blouse with round neck pattern. Embroidered sequins buttes highlighted on it. Bollywood and South Indian actress Shruti Hassan on the cover of Harper's Bazaar Bride. It is a blue bridal silk saree. Silver printed leafs all over saree and pure zari work border. It has running pallu. Paired with designer full sleeves saree blouse. South Indian actress Kajal Agarwal in beautiful designer kancheepuram bridal silk saree at Chennai Shopping Mall Opening. It is an mustard color wedding saree teamed with pinkish gold rich printed border, followed by green color kundan work patch border. Simple rich printed floral work bunches embellished throughout the saree. Paired with green designer embroidered quarter sleeves saree blouse. It is a silk saree blouse with muggulu work and mirrors enhanced all over.